Seated together at a hospital function, William “Bill” McCance turned and asked Karen McAlmon, MD, Chair of Neonatology, “If you could fund one initiative that the hospital does not have discretionary funds for, what would it be?” Dr. McAlmon’s eyes lit up as a dream suddenly entered the realm of possibility. Without hesitation, she responded, “I’d love to provide parents of babies in the Special Care Nursery (SCN) the opportunity to stream video of their newborn, giving them around-the-clock peace of mind. That’s true family-centered care.” (The SCN is a specialized unit designed for babies who are born early or with health issues.) Bill and his wife, Suzy, were more than intrigued. And after learning about real-time streaming from neonatal units, the Reading couple open-heartedly pledged their support. The McCance Family has multiple connections to Winchester Hospital’s Mother Baby Unit. Years ago, they chose to birth their own two babies there. Now, one of those “babies” is a student at the University of Alabama, Tuscaloosa, studying to become a nurse. Last summer, she returned to her roots to intern as a clinical associate in Winchester Hospital’s MBU. 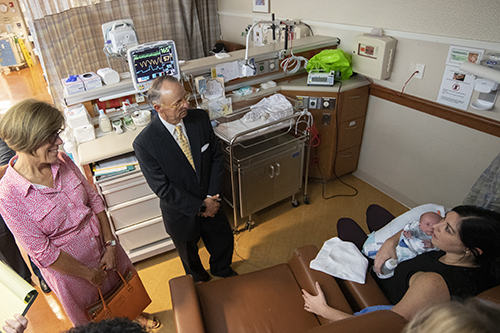 Through the generosity of the McCance Family in the spring of 2018, Winchester Hospital installed 10 cameras, two on rolling stands and eight mounted on the side of newborn bassinets. The cameras stream real-time video of babies to their parents and relatives. “There’s no need to be pulling out dated photos when you can be sharing a look at your baby in real time,” said Bill. The service was created to ease the anxiety of parental separation and to reduce stress around scheduling visits, especially for infants requiring lengthy stays and when care of other siblings is involved. Video streaming can also encourage the production of breast milk in the mother. Importantly, it helps preserve options for parental leaves. Some parents will feel comfortable continuing working at least part time while their baby is in the SCN, utilizing their leave once their newborn comes home. The viewing service is also a platform for nurses to share updates, such as, Your baby took a bottle at 7 a.m.
Privacy and security are, of course, paramount. Parents complete a consent form and create a personal password to have access to encrypted transmissions. The process is easy and intuitive, with instruction and technical support available. 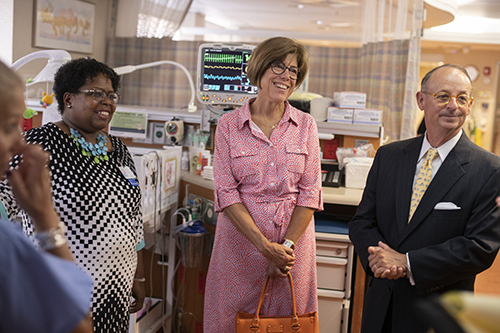 The McCances with Karen McAlmon, MD, (left) in the Special Care Nursery. NicView camera (center left) keeps watch on a sleeping baby. The McCances with Courtney Ferrari and baby Tysen.